Yes, there is a cubic buttload of stuff to read online, but you don’t have to skip that long article that looks sort of interesting because you’re slammed with work (or life) at the moment. Just remember your friendly Reading List feature or extension in your Web browser. With a read-later tool, you can quickly bookmark an article to a special area of your browser — and get to it when you actually have the time to sit down and read. If you’ve never used a save-for-later extension, they’re easy to add to your browser. Your operating system may even have tools in place already. For example, Apple’s Safari browser has had a Reading List built into its OS X and iOS versions for the past few years. When you find an article you want to stash for later, tap the Share icon and then tap Save to Reading List. (On the Mac keyboard, press Command-Shift-D to add the open page to the Reading List.) 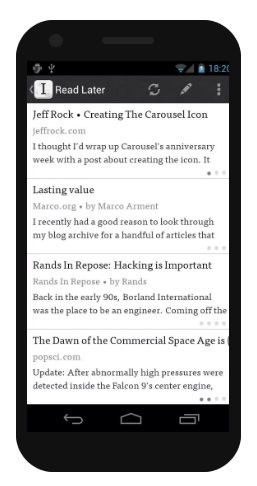 To get to your saved articles in Safari, click or tap the Bookmarks icon and then select the Reading List icon, which looks like a pair of glasses. If you’re hooked into the same iCloud account on all your devices, your saved articles appear in the Safari Reading List on all your screens, so you can save an article on your iPhone on Monday and read it that night on your iPad. Windows 8 has a similar Reading List app that you can get for your system, but even if your operating system doesn’t have such a tool built in, you can always add one on with a browser extension. These services usually require you to sign up for an account and then you can sync your saved articles across all your reading screens. 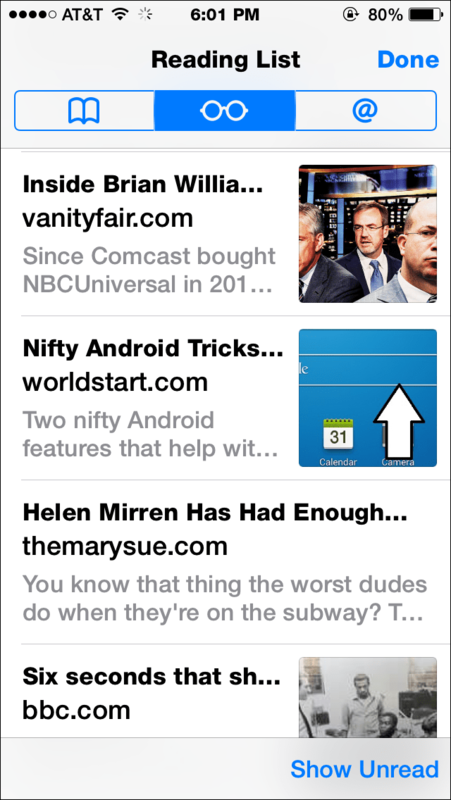 Pocket is one such add-in, with versions for Chrome and Firefox that can sync articles to your mobile device. The Instapaper app (shown here) works for Android, Kindle and iOS, and has desktop browser extensions to save articles to your Instapaper account. Readability, with its Android and iOS apps, is another comparable service. As a bonus, many of these services even offer a “reading view” that strips out all the clutter of ads and toolbars on the original page for distraction-free reading. You have plenty of options in this area, so look around until you find one you like. And once you do, start marking those articles. You can even save stuff throughout the week and then go back to your long reads — on a quiet weekend morning over a cup of caffeine. Think of it as your own personally curated weekly reader and the civilized way to keep up with the world on the Web.